For many teachers across Chicago Public Schools, this was an unusual day. At Beasley Elementary in the Washington Park neighborhood, Chicago Teachers Union President Karen Lewis rallied her troops and argued funding is exactly what the strike is about. Karen Lewis “We are dying a death of 1,000 cuts,” Lewis said. Lewis, who was greeted like a rock star by an energetic crowd, couldn't say whether Friday's strike is a fire drill for an open-ended strike later. But she hopes the day's action will bring a better contract offer to the negotiating table. CTU Vice President Jesse Sharkey started his day at Roosevelt High School in Albany Park. He hopes Friday’s walkout sparks action on the state budget. Jesse Sharkey “We’ve got to have everyone talking about what we need to do to have funding,” Sharkey said. “We need actions on the governor. We need more people to demonstrate, we need more unions to join in, and if we keep doing that I’m sure we’re going to win politically." Sharkey and CTU members were joined by supporters from around the world, including union activists from Korea and Brazil. Seattle City Council member Kshama Sawant was involved in the successful fight to raise the minimum wage in that city, and said she came to Chicago as a show of solidarity. After rallying at Roosevelt, the group marched to McDonald’s at Foster and Kedzie to rally for a $15-an-hour wage for fast food workers. From there the group moved to Northeastern Illinois University for a rally with American Federation of Teachers President Randi Weingarten. Chicago Public Schools had more than 250 contingency sites open across the city, including Skinner West Elementary on the Near West Side, where a couple dozen students showed up for the day. The union has taken criticism for taking students out of class for yet another day in addition to three furlough days issued by the district. In a statement, Gov. Bruce Rauner had harsh words, saying, “It's shameful that Chicago's children are the victims in this raw display of political power. ... I stand ready to work with members of the General Assembly to pass a budget that increases state support for all Illinois schools alongside much-needed reforms that put taxpayers back in control of their local governments and school districts." A broad coalition of activists pulled protests together, making for a day of action that is literally all over the place. Teachers joined fast food workers in the Fight for $15, outside McDonald’s restaurants. Rallies at Chicago State and Northeastern Illinois Universities called for higher education funding, with support from the Black Youth Project 100. 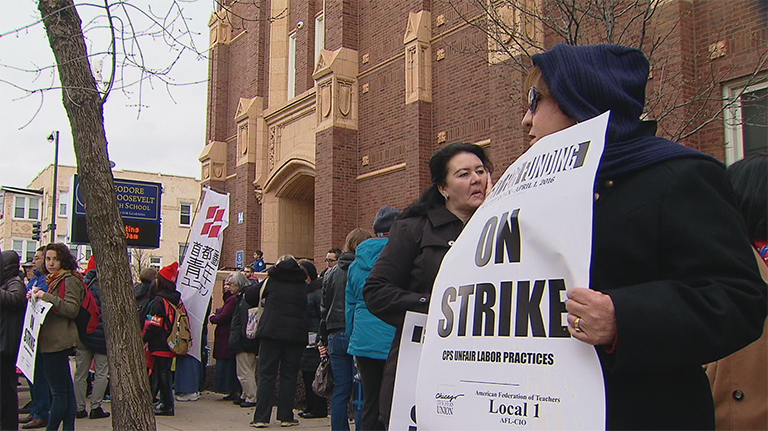 Nursing home workers joined the picket line at Harlan High School. Then, demonstrations at Cook County Jail opposed the school to prison pipeline. And Nabisco workers turned out at their plant to protest the loss of jobs. There's still the question of whether this strike is legal. The district maintains it isn't and filed a formal complaint. But the teachers say, it doesn't matter. Either way, teachers will be back at schools Monday morning, and back to the negotiating table soon after. March 31: The Chicago Teachers Union is preparing for a "day of action" on Friday with rallies and protests to take place from early morning through the evening. What are the alternatives for parents who need to drop their kids at school, what is the strike about, and is it even legal?